Shoreham Football Club’s hopes of Bostik League South survival were dealt another blow last night. Mussels were sent crashing to a 3-0 home defeat at the hands of Thamesmead Town – leaving them 13 points adrift at the foot of the table with just nine games to go this season. It was Shoreham’s second defeat at Middle Road in the space of just four days, all but ending any hope they had of pulling off a great escape this season. 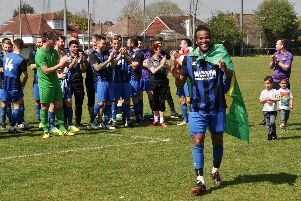 Mussels have struggled making the step up in to Bostik League football for the first time in their history, collecting just three league victories all season. Paul Vines got the opener after 21 minutes to set Thamesmead on their way in the meeting with Mussels. Shoreham had chances to get back in the match, before a late surge from the visitors took them to victory. Laurent Mendy and Danny Parish netted in second half stoppage-time as Thamesmead ran out comprehensive 3-0 victors in the end. Sammy Donnelly’s side need to start picking up points if they are to stay up. They have a chance to do so at Sittingbourne on Saturday.